ZAMBOANGA CITY (Uly Israel / 28 Nov) – The influential Sultan of Sulu and North Borneo, Sharif Ibrahim Ajibul Mohammad Pulalun, hailed Tuesday the Senate’s declaration of the Sheikh Karim al Makhdum Mosque in Tawi-Tawi Island and called it a milestone in Philippine history. The Sheikh Karim al Makhdum mosque at Tubig Indangan village in Simunul town is the oldest mosque in the country. The Senate has approved a proposal to declare the Philippines’ oldest Islamic landmark as a national shrine in recognition to the contribution of Islam in the development of culture and civilization in the country. Senator Edgardo Angara, its proponent, said the introduction of the Islamic faith in the Philippines “has immensely contributed to the enrichment, vibrancy and diversity” of the country’s unique culture. The mosque was constructed by an Arabian missionary, Sheikh Karim al Makhdum, in AD 1380. In 1965, the late president Ferdinand Marcos went to the site to install a historic marker giving it recognition as the first mosque in the Philippines. The Autonomous Region of Muslim Mindanao through its Legislative Assembly has already passed a law declaring the inclusion of the Sheikh Makhdum centennial celebration as one of the Islamic events entitled to a special non-working holiday within the five provinces under the ARMM. The bill, passed on third reading, “is a sign to our brother Moslems in Mindanao, that they are being accorded due and equal recognition by the national government,” Angara said. According to historical accounts, Sheikh Karim al Makhdum arrived in 1380 on Simunul Island off the province of Tawi-Tawi to propagate Islam in the country. It was also on this island that he built the first and the oldest mosque in the country. It is held in great esteem by Muslims and non-Muslims, and is considered sacred. Sultan Pulalun appealed to Senator Edgardo Angara that the mosque in Likup village in Indanan town in Jolo Island declared also as a national shrine being the second oldest mosque in the Philippines and because events of historical importance took place at the mosque. He said at the height of Muslim rebellion against American colonial government, Muslim rebel leaders met with General Leonard Wood at the mosque wherein historical talks and agreements were forged. “We are overjoyed by the recognition being given to the contribution of the Islamic faith to the country’s history,” he told the Mindanao Examiner. 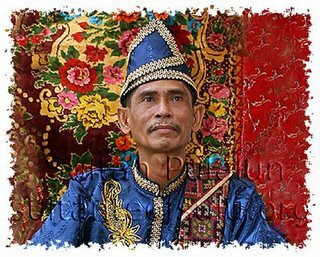 Pulalun, a descendant of Sultan Mohammad Pulalun, heads the Sultanate of Sulu and North Borneo, now Sabah. Sultanate of Sulu obtained Sabah from Brunei as a gift for helping put down a rebellion on the Borneo Island. The Sultanate of Sulu was a Muslim state that ruled over much of the islands off the Sulu Sea. It stretches from a part of the island of Mindanao in the east, to North Borneo, now known as Sabah, in the west and south, and to Palawan, in the north. Mosque As National Shrine �”. Thanks for pretty much all the actual information. mEDYO NALILITO LANG PO ,, SINO NAMAN PO SI SULTAN KIRAM III ? Maraming Sultans and most of them are relatives and clan members and they do not get well with each other kaya sila-sila ay hindi magkasundo. They wanted to be recognized in order to get whatever Malaysia pays – about P77,000 – in yearly cession money for the use of Sabah.